In previous articles, I have talked about selecting a system or process before choosing your powder coating equipment. After you have established your process and have a rough idea of the timing of each step, you can select equipment to meet your production requirements. Setting up a powder coating shop involves many variables besides powder or pretreatment. The size of part to be coated, layout of shop to be used, labor, parts per day requirement, staging of racks or parts in process, loading area, and unloading area are all factors that must be addressed when designing a work area. 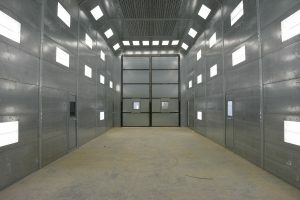 What’s The Largest Item You Will Be Powder Coating? The first factor to consider when sizing your equipment is the size of the parts you’ll be coating. Determine the size of the largest part you will be routinely powder coating and use that as the base size for your equipment. If your typical part is small, instead decide how many you want to coat at one time and how large the rack(s) will be to accommodate your throughput. Once you have those measurements, you’ll need equipment that is appropriately sized for your application. For the powder spray booth, typically you will need 2-3 additional feet around the part so the operator can easily apply powder to the part without walking or spraying outside the booth. The powder oven (checkout one from Reliant) can usually be smaller than the booth, but you still must account for the size of the rack(s) in the oven. If you are using multiple racks, you will want enough space inside the oven so the racks do not bump against each other and the doors can still be completely closed. For example: If your rack of parts is four (4) feet wide, five (5) feet tall, and six (6) feet long, you will want an eight (8) feet wide by ten (10) feet long booth with at least an 8 foot ceiling. This will give you two (2) feet all the way around the part, so the operator does not have to move the rack while powder coating. The additional height above the rack will allow the powder to go around the parts and not get deposited on the ceiling lights. This same rack can go in a six (6) feet high, six (6) feet wide, and eight (8) feet long oven. The smaller oven helps to bake the parts more efficiently. Exterior dimensions of the equipment need to be known so that you can plan a good shop layout. Make sure you have enough room in your shop for not only the equipment, but adequate turning space for your parts or racks, and staging areas for parts moving into and out of your pretreatment, coating and curing areas. 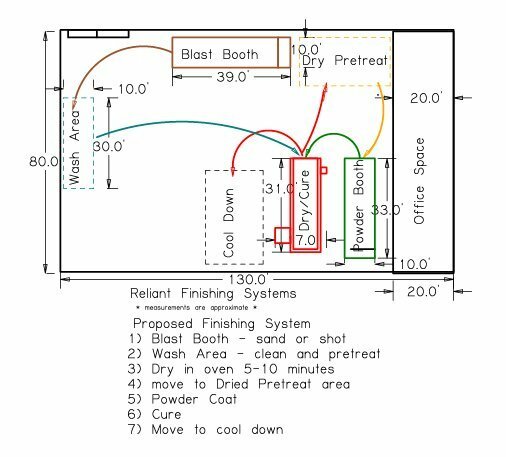 Sample powder coating system layout with curing oven, powder booth, blasting booth and wash area shown. When laying out your shop, be certain you have enough space to satisfy your local safety code requirements. Code varies from place to place (and I strongly encourage you to make the local code inspector your friend prior to a large equipment purchase) but a good rule of thumb is to make sure all components are at least three (3) feet away from each other and the shop walls or structures. Roof height is also an issue. You want at least three (3) feet clearance above the components and you do not want sprinkler systems (unless rated for 350F) or air hoses running over your oven. Your roof supports can sometimes be closer, but you will need to determine that with your local code authority. Walkways, emergency escape routes, and staging areas for racks are other factors to consider when planning your shop layout. Be sure and have good access to utilities such as gas and power for the booth and oven. Water should be run to the area where you plan to have pretreatment and cleaning processes. Drains or water capture alternatives are also important; depending on your finishing process, you should plan these well in advance. How Many Parts Per Day Do You Need To Powder Coat? Another key factor for equipment planning is production requirements. In a batch system, you are only as efficient as your slowest stage. Typically this stage will be cure time. Since the average cure time for polyester is metal temperature reaching 400F for 10 minutes, this usually means a 20 minute dwell time for gauges around 18-16 gauge. Quarter inch angle iron can take 30-40 minutes and some castings can take 45-60 minutes to reach the part temperature of 400F for ten minutes. Of course, powders vary in cure cycles as do metals in time it takes to reach their required cure time. I recommend running an oven recorder regularly to set your dwell times to reach optimal cure times. Figure out your slowest cycle time, I’ll assume curing, although it could be metal preparation. A typical cycle time would be 20 minutes. That gives you 24 cycles times in an 8 hour shift, if you run everything at 100% efficiency. For example, if you do muffler tubes and can rack 100 tubes per cycle, your maximum daily production rate will be 2,400 muffler tubes. If you need more production, you can add more ovens till something else becomes your lowest cycle time, or bottleneck. When labor cost starts to increase too much by adding multiple ovens or booths, then you can look at automatic solutions. Many beginning powder coaters think of automation right away, but I would almost always recommend trying to achieve your production goals with batch systems first. That way you learn the process and what it takes to achieve a good finish. Batch systems also give more flexibility and adjust to different powders, metals, thicknesses, and process better than automated lines. Now if they have to have 10,000 parts a day, automation is probably the way to go. Purchasing the correct equipment can be a little overwhelming, but by identifying the key factors, the equipment purchasing decision gets easier. Preparation: Am I blasting and/or washing? If yes, then you need a blast booth and/or wash booth. Preheat/Dry: Do I need to preheat my parts due to pretreat drying, process or out gassing? If yes, then decide whether an extra oven is necessary or if you have capacity with your cure oven. Size Of Parts And Racks: This determines the size of your equipment and necessary workflow requirements. Available Area In Shop: This determines the amount of equipment you can fit or whether you need additional shop space. Parts Per Day: Determines the amount of booths and ovens you will need to achieve your current and future production goals. This entry was posted in News on September 1, 2015 by Bruce Chirrey.